Survey respondents said updates on city initiatives and crashes are important, upcoming events not so much. The quarterly Mayor’s Bicycle Advisory Council meetings can be useful events for the public to get an update on the city’s bike initiatives and other local cycling developments, and lately they’ve been drawing a crowd to City Hall. While the MBAC meetings started out as a strategy for inter-agency coordination, in recent years more and more civilians have been showing up, and there’s often not enough time to cover everything on the official agenda as well as questions from residents. At last week’s meeting, Chicago Department of Transportation bike program staffer Amanda Woodall went over the results of an online survey CDOT held in January to try to determine whether residents would prefer a different format for the meetings. “We wanted these [sessions] to be more productive for everyone involved,” Woodall said. 125 people responded to the survey. 63 percent of respondents were male, most were over 35, and 83 percent identified themselves as white (the only other options for race were Asian and Black or African American). The vast majority live on the North Side of Chicago, and almost half of them have been riding in the city for ten years or more, chiefly for commuting purposes. A full 84 percent said conditions for cycling have improved since they started biking in Chicago. 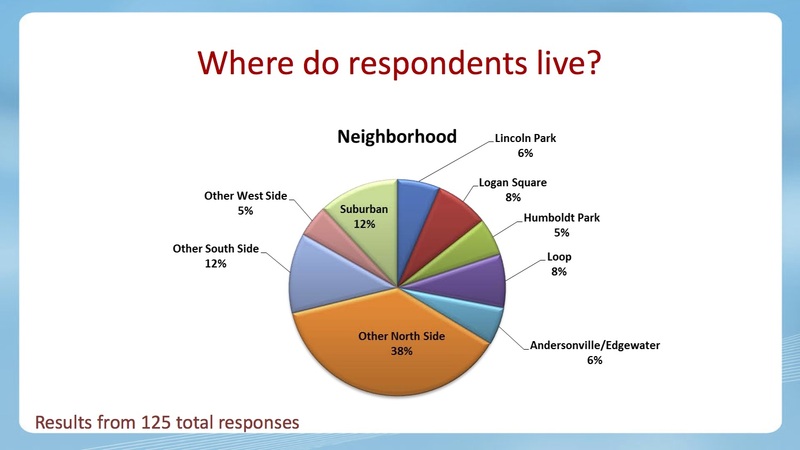 The vast majority of survey respondents live on the North Side. One thing that limited the survey’s usefulness is that only 51 of the 125 participants had actually attended an MBAC meeting in the past year. Of those 51 people, the vast majority said that city initiatives and crash updates were agenda items worth including at future meetings, while upcoming events and non-profit initiatives were seen as the least important agenda items. Given the choice of changing the meeting format to focus on a particular topic each month, 39 percent of the respondents preferred to keep the format the same. Smaller numbers of participants were interested in changing the meetings to focus on a particular topic, geographic area (such as the South Side, West Side, or North Side), or stakeholder group each quarter. Woodall said the responses didn’t result in any “great light bulbs going off here” in terms of obvious tweaks needed for the meeting format, and no major changes are planned. But she added that there would be updates about any foreseen changes at future meetings. There was one very obvious omission from the list of possible changes to the meetings listed as options on the survey. Since the sessions take place from 3 to 4:30 p.m. on Wednesdays, it can be difficult for people who work during business hours to attend. Holding the meetings after work or on weekends would make them much more convenient for many residents. This change would also benefit city staffers who are interested in getting input from a group of citizens that is more representative of Chicago’s general population, rather than just those who are free on a Wednesday afternoon. Someone from the CPD should be in attendance to field questions and concerns about enforcement (or lack thereof) at every meeting. I completed the survey but don’t go to the meetings, the fact they even exist at all is frankly a miracle as far as I’m concerned. If you had told me 20 ( or even 10) years ago this kind of opportunity for public input would be a thing I would have offered to refill your drink. What if the city focused on creating a cohesive bike network in a single ward? Now we're getting a chance to see that idea put in action.